NutraBio® Naturals PRE sets the standard for hard hitting amino acid based pre-workouts. It’s designed to push you through the most treacherous workouts with ease. It's able to achieve this because it’s formulated with a potent array of amino acids combined with an all-inclusive stimulant complex designed specifically for athletes. Compare it to any pre-workout on the market and they just can't compete. 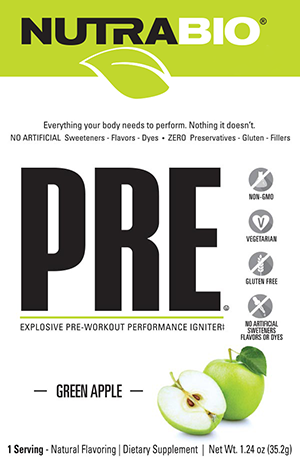 If you want to take your workouts to the next level, then PRE is your pre-workout solution. 6000mg of L-Citrulline - Increases nitric oxide production, reduces fatigue and improves endurance. 3200mg of Carnosyn Beta-Alanine to increase endurance and counteract fatigue. 3500mg of L-Leucine to prevent muscle catabolism and reduce recovery time. 750mg of Nitrosigine promotes vasodilatation, improves muscle pumps and increases vascularity. 1500mg of Tyrosine reduces fatigue, improves mood and increases alertness. 350mg combined of PurCaf™ Organic Caffeine and Infinergy Di-Caffeine Malate to boost energy, enhance focus, increase training intensity with no caffeine crash. 3000mg of PharmaPure™ Creatine Monohydrate for strength, power and muscle growth. 500mg of Creatine Magnapower® for increased solubility and absorption. 300mg of Theapure L-Theanine to promote enhanced cognition and attention. 100mcg of Huperzine A to promote strong mind-muscle connection and mental focus. 2500mg of Betaine Anhydrous to support creatine production, increase power and strength output and protect cells from dehydration. 1000mg of Agmatine Sulfate and 750mg Nitrosigine to stimulate nitric oxide pathways, improve vasodilation and increase muscle pumps. 2710mg Electrolyte and Hydration Optimizer that helps maintain water balance in the muscle, facilitates motor neuron function and increase exercise capacity. Now enjoy the same powerful formula with no artificial colors, flavors or sweeteners.